The floor lamp, shades, and black pillow were provided by JCPenney for a sponsored campaign. This is not a sponsored post. With warmer days upon us, we don't really need the heavier throw blankets we hid beneath in Winter. We can swap those out with throws in lighter fabrics or loose knits perfect for chilly evenings. Spring is full of life and color and we can mirror that feeling in our home with brighter colors and fun patterns in our textiles. Even switching out your usual color scheme in lighter fabrics bring a fresh feel to a space. I like mixing in these coral velvet pillows with the pillows I already had on the sofa to brighten everything up. The color looks fantastic with the green fabric on the Jenna sectional from The Futon Shop. When choosing colors to go with each season, look at the undertones of the color. 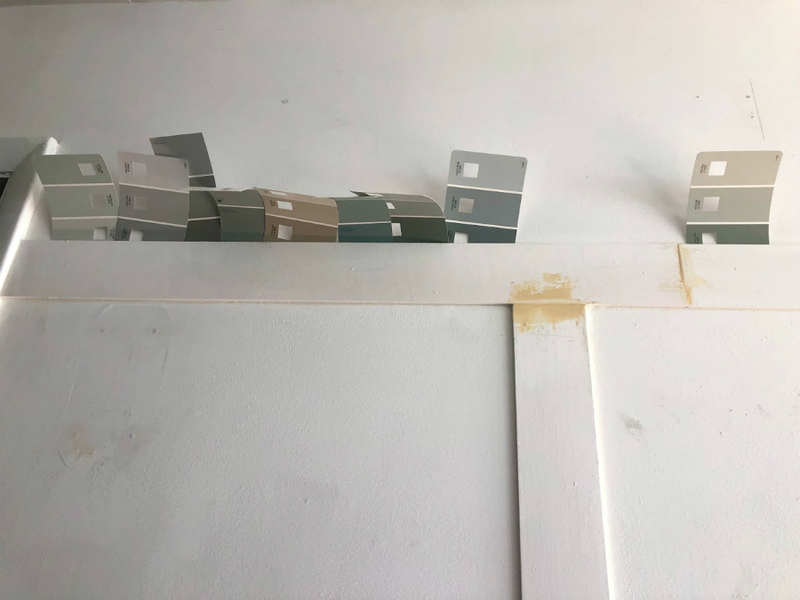 Something muted or grey based is usually better suited for fall and winter whereas richer and brighter colors are best for Spring and Summer. Of course, it depends on a lot of things and that may not be the case for your home but it can be a good starting point. With longer days and April showers on the horizon, lighting our spaces shifts in needs. I find I no longer need to illuminate the whole space evenly as I did in Winter. Now, I need more ambient and task-specific lighting since the sun keeps the rooms bright enough. What is the natural light like in your space? Could your lamps be moved around to better suit what you need light for this season? 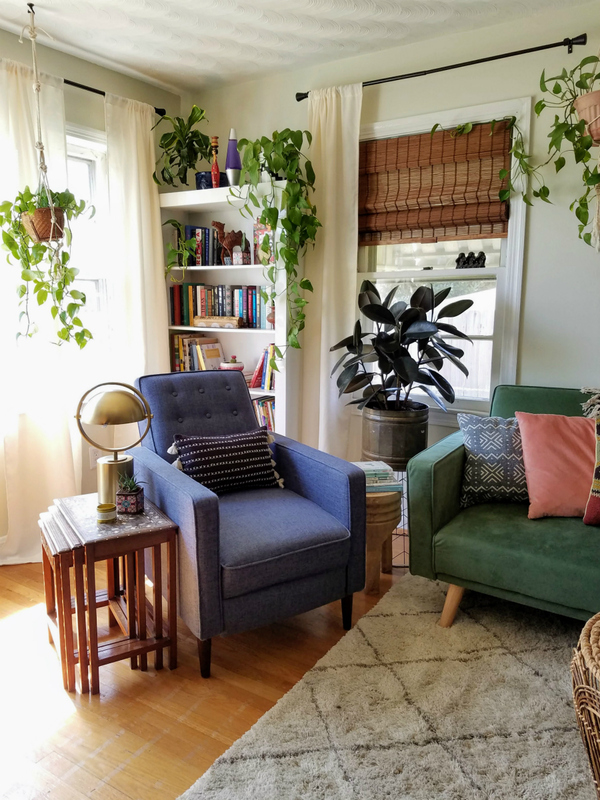 I find that I mostly need light in the late evenings for reading so I have placed a pharmacy style floor lamp next to the chaise side of the sofa. I still have a lamp next to the recliner and a lantern for a soft glow late at night. Soon I'd like to place wall mounted sconces on either side of the TV for more control over the light in this space. Spring means longer days and more sunlight coming into your space. 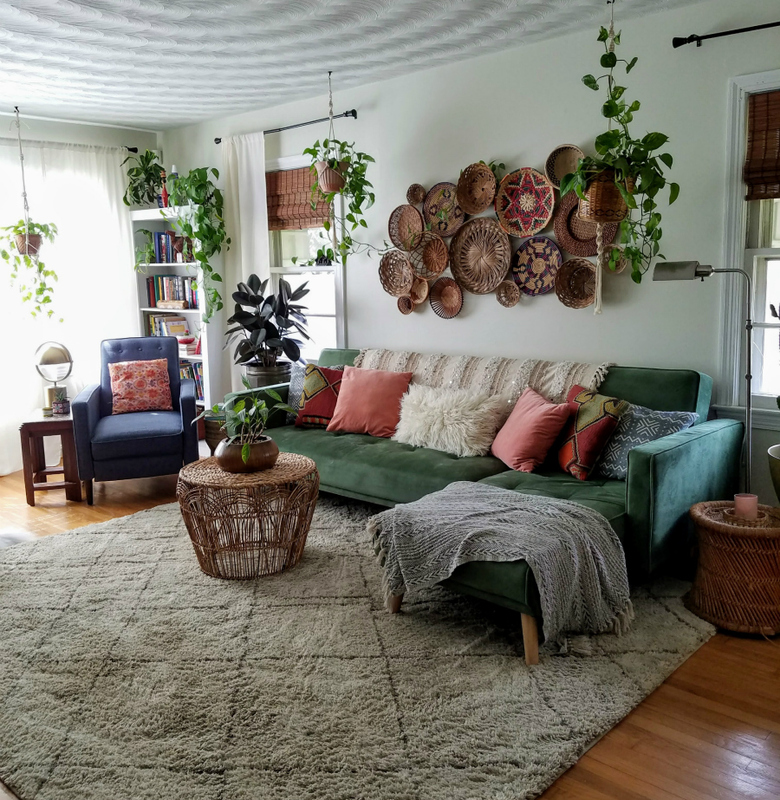 I found there was a lot of light coming in the west-facing walls in the evening and it would cause a glare on the TV and the room would warm up. For a stylish solution, I chose to install bamboo roman shades that I can close in the evenings for a more comfortable space. A classic look you can try is a black curtain rod, white curtains, and a bamboo shade. The combination brings multiple textures and elements you can use throughout a space but are neutral enough that you don't have to. Your welcome mat takes quite a beating in the frigid winter months. As does the rug inside your front door. Washing them or replacing them is an easy way to freshen up this part of your home. And for people like myself, this area is part of the living room. If your welcome mat is beyond help or you've got the budget for a new one, then a new one can freshen up a space more than you may think! I discovered recently that we still had a glitter reindeer hanging on our front door. I'm overdue to change that out but it's also the perfect time to hang a new wreath or another type of door decor. And that's not just for your front door. You can layer a wreath over top large art, on a blank wall, on cabinet doors, overtop a mirror. The greenery and flowers or whatever feels like Spring renewal to you will help bring fresh air to the space. If you're one of the lucky ones with flowers already blooming, fill a vase with them for a no-cost way of bringing Spring indoors. If you can treat yourself to a bouquet while out doing errands, it's a good excuse to dig out your vases. Even clipping some fresh greenery from around your home as it grows will brighten up your space. This time of year, all of the stores are putting out beautiful vases for sale. If you're needing to fill in your decor with a new vase, now is a great time to look for one. 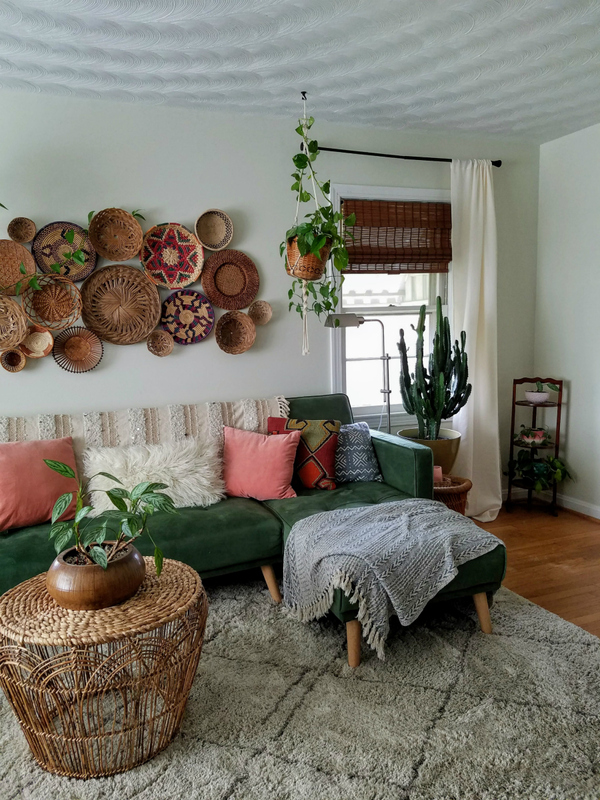 I started out with just one neutral vase I could use year round and as I've been able to spend money I filled in my vase collection with pieces I've found on clearance and at thrift stores. Local nurseries are going to be filled with loads of new indoor and outdoor plants. 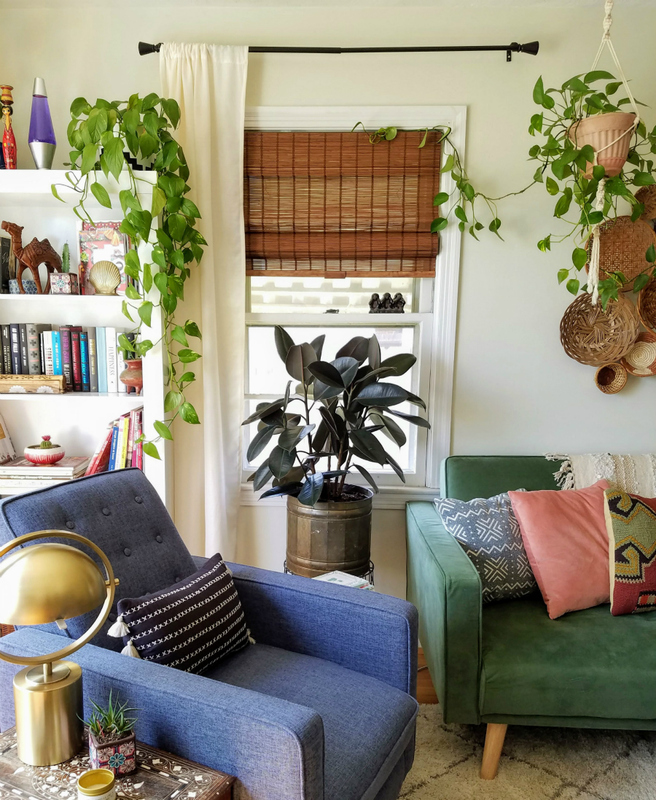 So while you're picking up supplies for the outdoor garden, why not spruce up the inside of your home with a new plant, too? It's a perfect time of year to do it so the plant has time to acclimate before the next winter season. Do you hang art prints on your walls or display them on shelves? If you do, you can swap these in and out each season to bring a different feeling to your space. For a free option, try pixabay. For low cost, you can print art at home through a lot of Etsy sellers. If you're needing frames and prints, a service like Art To Frames may be what you're looking for. There are some scents that just speak to different seasons of the year. For spring, things like florals and citrus stand out to me but that may be different for you. I know I enjoy musky, earthy scents all year long but it's nice to have some candles on hand to burn when you really need to channel the Spring vibes into a space. If you have tapers or votives you can change them to more colorful ones. Jarred candles can be swapped out with fruity or floral scents. Perhaps the most important part of refreshing your space for Spring is the edit. Clear out the dust, clear out the clutter. Let your space breath. 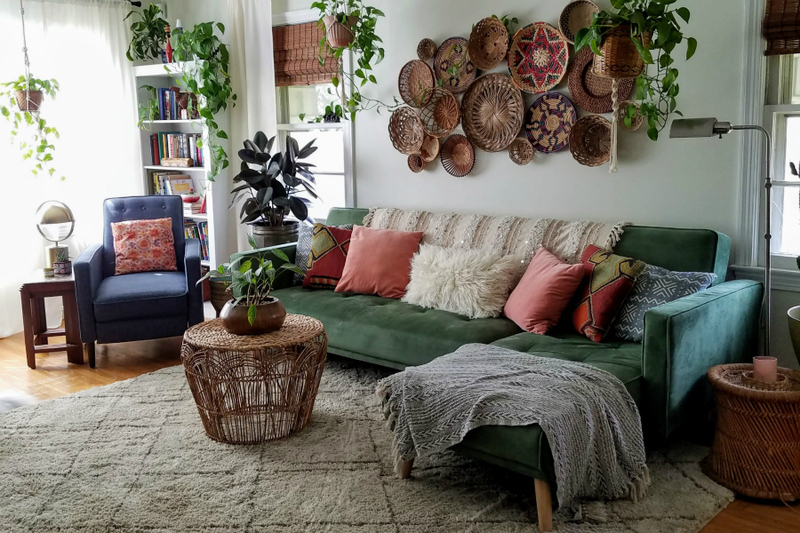 Try taking some layers and decor out of the space. Open the windows and doors and let some fresh air fill the room. Make sure windows and vent registrars are clean and ready to be used. Clean pillow cushions and blankets. You'll be able to breathe easier having the air in your room fresh and clean. What does Spring mean for you in your home? Spring for a lot of us means we will be spending less time indoors and more time outdoors. But our home still needs to be a place of refuge after these long days. Give yourself some space to enjoy and get creative with. 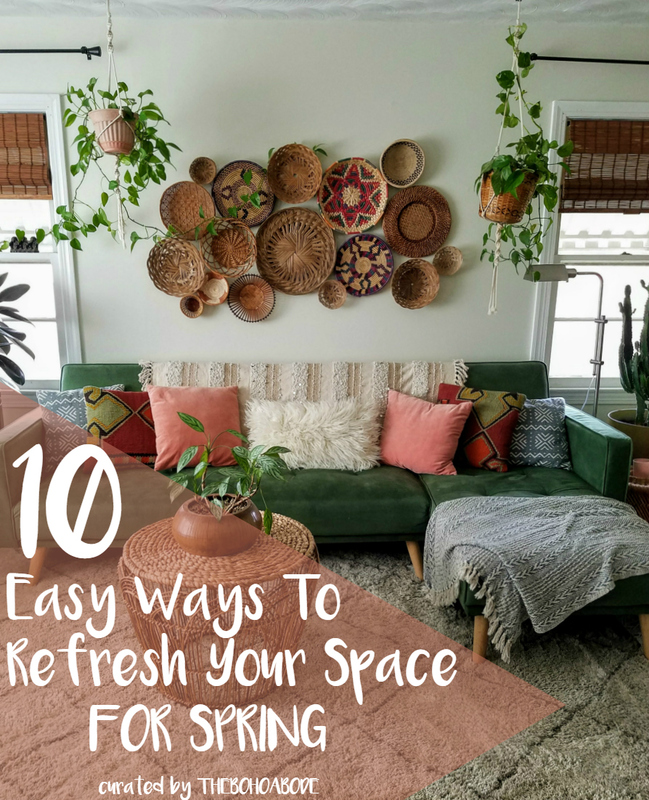 It's the free-est of options for getting your space ready for Spring. Adding new elements to your space as you can will help you curate the vibe you want in the space. 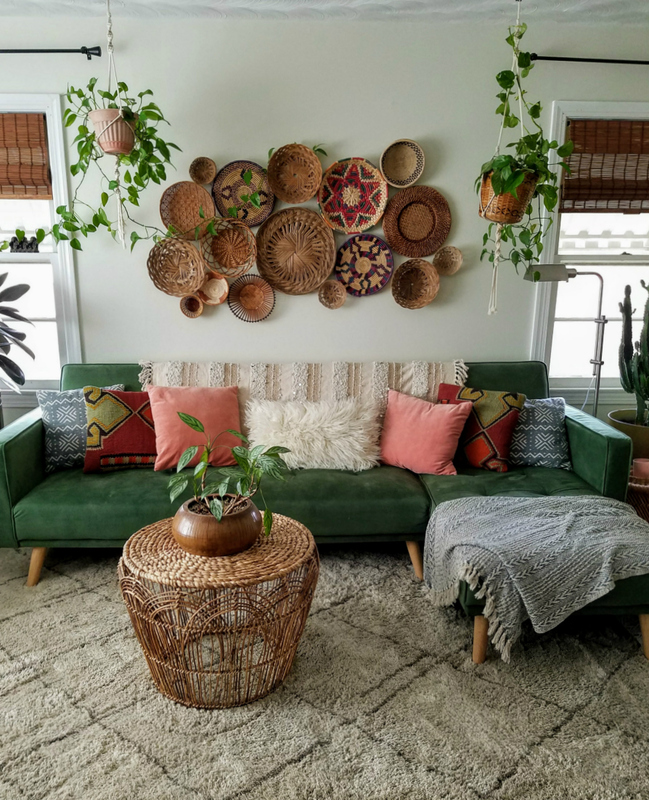 What kind of vibe do you want in your living room? How do you want to feel in the space? 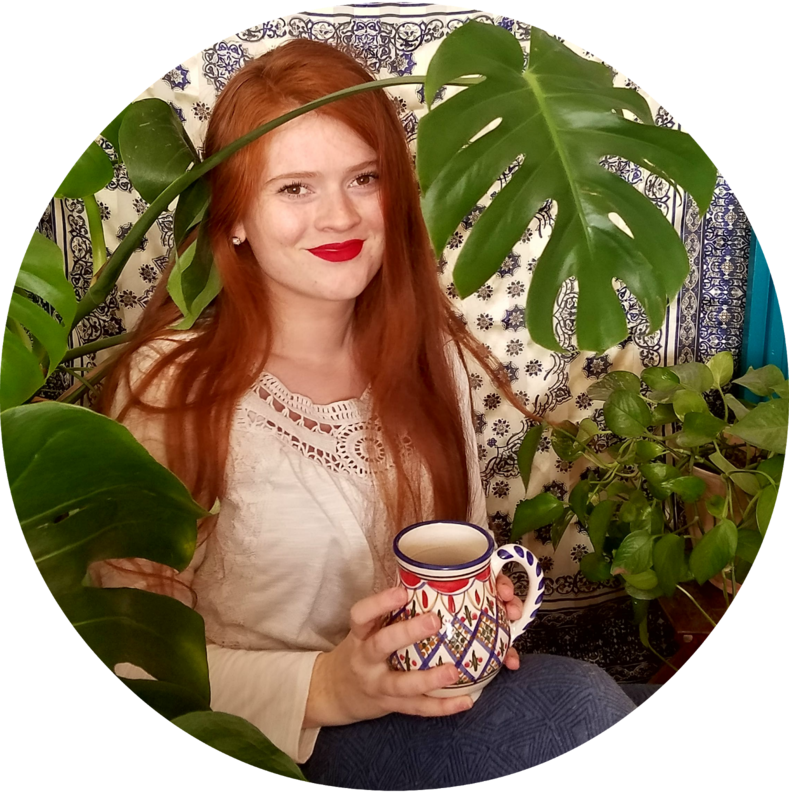 For spring, I like to feel rejuvenated, relaxed and welcoming. Remember to fill your space with the smells, colors, and textures that speak to you and arrange the space for the life you live in it. Let me know what changes you're making for Spring in your home in the comments below or tag me on Facebook/Instagram. 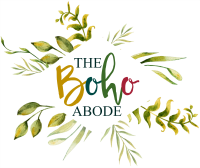 We've created a community for boho home lovers on Amino, come join us and share your spaces!